The full patch notes can be seen at the bottom of this post. 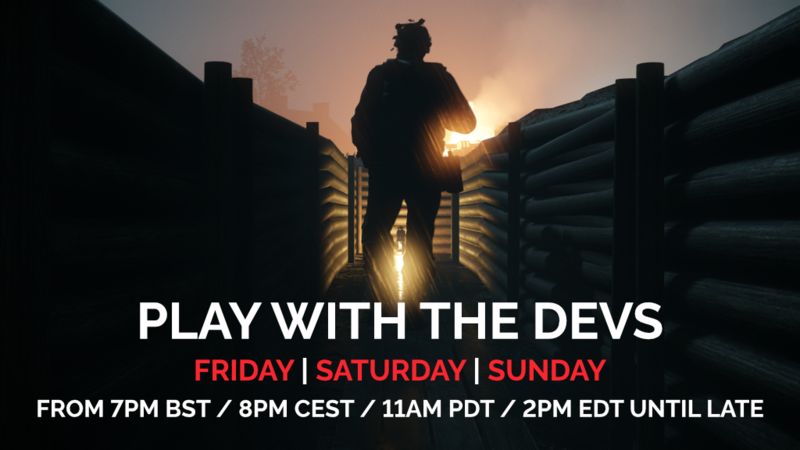 This weekend we will be hosting several game sessions each evening from 7PM BST / 8PM CEST / 11AM PDT / 2PM EDT until late. So get your squad together and join our community and the devs on the battlefield! There will also be a live-stream of the game this Saturday when TeamApex take to the battlefield, featuring BigfryTV, Shermanator, Karmakut, FriendlyNikolai, KILLSTREAKNET, & LordQuode. Join us in-game on or tune in to the stream on [noparse]twitch.tv/bigfrytv[/noparse] at Noon EDT / 9AM PDT / 5PM BST / 6PM CEST. Thank you to everyone who has provided us with constructive feedback. We read all of it even if we don’t respond to all of it. If you have a crash and get prompted to submit a crash report – please submit it so we are notified and we can look into the cause. Streaming matches, organising teams. Some of us will try to catch up! Just had a water pump failure on my Fury X and must get it fixed before games can be played. Where's the link to the updates? There's no message box in the game and no thread on this forum. The update should be downloaded automatically from Steam. If it hasn't been detected then you can right-click on the game open properties then find the option to verify and it will check your files against the latest version. you got a 440 in that fury? We've started with 60 seconds but if it needs changing we will. Don't forget it only applies if you are alive - if you are dead and spectating there is no countdown. Yeah, it may be that 60 isn’t very long? What is the reason for kicking idle players, may I ask? Surely it would only cause a problem if servers were full and people couldn’t get in. Jake - I'm planning on the Aquarius D5 pump and fittings. It seems to be the only option, but it's not cheap and it is to be fitted to the existing cooling plate. Skydance - the kick only applies in game, and it's a way of preventing place-holders filling the server. A major part of Raid is about how many players are alive and in the case of the Germans they get "Last Man Standing" triggered when their last player dies which can could easily change the outcome of the match in a tightly contested game. A couple of suggestions about the start/end of game, in a lobby. VG lobby text is much too small to read quickly. Usually there is a list of about 10 servers per lobby screen with quick and easy to read large text, and the match server should use the same large text, showing team name, player name and ping. Then when the match starts, a player screen to choose equipment which is exited by the player. This would be a good method to use.